1 Hear, O God, my shrill cry, Attend to my prayer. 3 For Thou hast been a place of refuge for me, A tower of strength from the face of the foe. 4 Let me dwell a guest in Thy tent for ever, Let me find refuge in the covert of Thy wings. Selah. 5 For Thou, O God, hast hearkened to my vows, Thou hast given [me] the heritage of them that fear Thy name. 6 Days mayest Thou add to the days of the king, May his years be as many generations. 7 May he sit before God for ever: Give charge to loving-kindness and troth, that they guard him. 8 So will I harp to Thy name for aye, That I may fulfil my vows day by day. The situation of the singer in this psalm is the same as in Psalm lxiii. In both he is an exile longing for the sanctuary, and in both "the king" is referred to in a way which leaves his identity with the psalmist questionable. There are also similarities in situation, sentiment, and expression with Psalms xlii. and xliii.--e.g. , the singers exile, his yearning to appear in the sanctuary, the command given by God to His Loving-kindness (xlii. 8 and lxi. 8), the personification of Light and Troth as his guides (xliii. 3), compared with the similar representation here of Loving-kindness and Troth as guards set by God over the psalmist. The traditional attribution of the psalm to David has at least the merit of providing an appropriate setting for its longings and hopes, in his flight from Absalom. No one of the other dates proposed by various critics seems to satisfy anybody but its proposer. Hupfeld calls Hitzig's suggestion "wunderbar zu lesen." Graetz inclines to the reign of Hezekiah and thinks that "the connection gains" if the prayer for the preservation of the king's life refers to that monarch's sickness. The Babylonish captivity, with Zedekiah for "the king," is preferred by others. Still later dates are in favour now. Cheyne lays it down that "pre-Jeremian such highly spiritual hymns (i.e., Psalms lxi. and lxiii.) obviously cannot be," and thinks that "it would not be unplausible to make them contemporaneous with Psalm xlii., the king being Antiochus the Great," but prefers to assign them to the Maccabean period, and to take "Jonathan, or (better) Simon" as the king. Are "highly spiritual hymns" probable products of that time? If the Selah is accepted as marking the end of the first part of the psalm, its structure is symmetrical, so far as it is then divided into two parts of four verses each; but that division cuts off the prayer in ver. 4 from its ground in ver. 5. Selah frequently occurs in the middle of a period, and is used to mark emphasis, but not necessarily division. It is therefore better to keep vv. 4 and 5 together, thus preserving their analogy with vv. 2 and 3. The scheme of this little psalm will then be an introductory verse, followed by two parallel pairs of verses, each consisting of petition and its grounding in past mercies (vv. 2, 3, and 4, 5), and these again succeeded by another pair containing petitions for the king, while a final single verse, corresponding to the introductory one, joyfully foresees life-long praise evoked by the certain answers to the singer's prayer. The fervour of the psalmist's supplication is strikingly expressed by his use in the first clause, of the word which is ordinarily employed for the shrill notes of rejoicing. It describes the quality of the sound as penetrating and emotional, not the nature of the emotion expressed by it. Joy is usually louder-tongued than sorrow; but this suppliant's need has risen so high that his cry is resonant. To himself he seems to be at "the end of the earth"; for he measures distance not as a map-maker, but as a worshipper. Love and longing are potent magnifiers of space. His heart "faints," or is "overwhelmed." The word means literally "covered," and perhaps the metaphor may be preserved by some such phrase as wrapped in gloom. He is, then, an exile, and therefore sunk in sadness. But while he had external separation from the sanctuary chiefly in view, his cry wakes an echo in all devout hearts. They who know most about the inner life of communion with God best know how long and dreary the smallest separation between Him and them seems, and how thick is the covering spread over the heart thereby. The one desire of such a suppliant is for restoration of interrupted access to God. 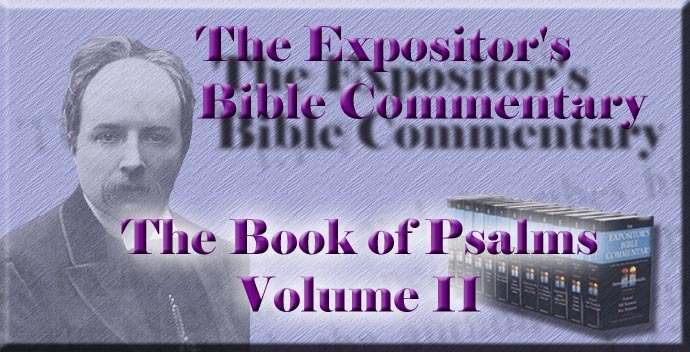 The psalmist embodies that yearning in its more outward form, but not without penetrating to the inner reality in both the parallel petitions which follow. In the first of these, (ver. 2 b) the thought is fuller than the condensed expression of it. "Lead me on" or in, says he, meaning, Lead me to and set me on. His imagination sees towering above him a great cliff, on which, if he could be planted, he might defy pursuit or assault. But he is distant from it, and the inaccessibility which, were he in its clefts, would be his safety, is now his despair. Therefore he turns to God and asks Him to bear him up in His hands, that he may set his foot on that rock. The figure has been, strangely enough, interpreted to mean a rock of difficulty, but against the usage in the Psalter. But we do not reach the whole significance of the figure if we give it the mere general meaning of a place of safety. While it would be too much to say that "rock" is here an epithet of God (the absence of the definite article and other considerations are against that), it may be affirmed that the psalmist, like all devout men, knew that his only place of safety was in God. "A rock" will not afford adequate shelter; our perils and storms need "the Rock." And, therefore, this singer bases his prayer on his past experience of the safe hiding that he had found in God. Place of refuge and strong tower are distinctly parallel with "rock." The whole, then, is like the prayer in Psalm xxxi. 2, 3: "Be Thou to me a strong rock. For Thou art my rock." The second pair of verses, containing petition and its ground in past experience (vv. 4, 5), brings out still more clearly the psalmist's longing for the sanctuary. The futures in ver. 4 may be taken either as simple expressions of certainty, or, more probably, as precative, as is suggested by the parallelism with the preceding pair. The "tent" of God is the sanctuary, possibly so called because at the date of the psalm "the ark of God dwelt in curtains." The "hiding-place of Thy wings" may then be an allusion to the Shechinah and outspread pinions of the Cherubim. But the inner reality is more to the psalmist than the external symbols, however his faith was trained to connect the two more indissolubly than is legitimate for us. His longing was no superstitious wish to be near that sanctuary, as if external presence brought blessing, but a reasonable longing, grounded on the fact for his stage of revelation, that such presence was the condition of fullest realisation of spiritual communion, and of the safety and blessedness thence received. His prayer is the deepest desire of every soul that has rightly apprehended the facts of life, its own needs and the riches of God. The guests in God's dwelling have guest-rights of provision and protection. Beneath His wings are safety, warmth, and conscious nearness to His heart. The suppliant may feel far off, at the end of the world; but one strong desire has power to traverse all the distance in a moment. "Where the treasure is, there will the heart be also"; and where the heart is, there the man is. The ground of this second petition is laid in God's past listening to vows, and His having given the psalmist "the heritage of those that fear Thy name." That is most naturally explained as meaning primarily the land of Israel, and as including therein all other blessings needful for life there. While it is capable of being otherwise understood, it is singularly appropriate to the person of David during the period of Absalom's rebellion, when victory was beginning to declare itself for the king. If we suppose that he had already won a battle (2 Sam. xviii. 6), we can understand how he takes that success as an omen and urges it as a plea. The pair of verses will then be one instance of the familiar argument which trustful hearts instinctively use, when they present past and incomplete mercies as reasons for continued gifts, and for the addition of all which is needed to "perfect that which concerneth" them. It rests on the confidence that God is not one who "begins and is not able to finish." Very naturally, then, follows the closing prayer in vv. 6, 7. The purely individual character of the rest of the psalm, which is resumed in the last verse, where the singer, speaking in the first person, represents his continual praise as the result of the answer to his petitions for the king, makes these petitions hopelessly irrelevant, unless the psalmist is the king and these prayers are for himself. The transition to the third person does not necessarily negative this interpretation, which seems to be required by the context. The prayer sounds hyperbolical, but has a parallel in Psalm xxi. 4, and need not be vindicated by taking the dynasty rather than the individual to be meant, or by diverting it to a Messianic reference. It is a prayer for length of days, in order that the deliverance already begun may be perfected, and that the psalmist may dwell in the house of the Lord for ever (cf. Psalms xxiii. 6; xxvii. 4). He asks that he may sit enthroned before God for ever--that is, that his dominion may by God's favour be established and his throne upheld in peace. The psalm is in so far Messianic that the everlasting kingdom of the Christ alone fulfils its prayer. The final petition has, as has been noticed above, parallels in Psalms xlii., xliii., to which may be added the personifications of Goodness and Loving-kindness in Psalm xxiii. 6. These bright harnessed angels stand sentries over the devout suppliant, set on their guard by the great Commander; and no harm can come to him over whom God's Loving-kindness and Faithfulness keep daily and nightly watch. Thus guarded, the psalmist's prolonged life will be one long anthem of praise, and the days added to his days will be occupied with the fulfilment of his vows made in trouble and redeemed in his prosperity. What congruity is there between this closing verse, which is knit closely to the preceding by that "So," and the previous pair of verses, unless the king is himself the petitioner? "Let him sit before God for ever"--how comes that to lead up to "So will I harp to Thy name for ever"? Surely the natural answer is, Because "he" and "I" are the same person.